A compare and contrast of music that goes beyond the stunning musicological feat, beyond the intense dynamic performance and astounds the listener with every track. 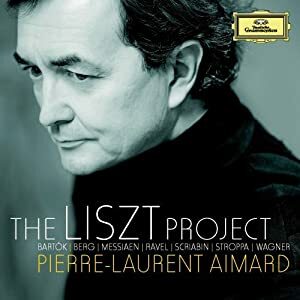 French pianist Pierre-Laurent Aimard honors Franz Liszt’s 200th birthday (October 22) with his most ambitious recording for Deutsche Grammophon, The Liszt Project. Over the course of more than two hours of music Aimard compares and contrasts works for solo piano by Liszt with a thought-provoking selection of works by Wagner, Berg, Scriabin, Bartók, Stroppa, Ravel and Messiaen. This is Aimard’s fourth solo album for Deutsche Grammophon and follows his highly acclaimed recordings of Bach, Messiaen and Ravel. The album is in stores and available today. The Liszt Project is a haunting album of thought-provoking brilliance. Starting with La Lugubre Gondola by Lizst, played with tender angst which highlights the proposed premonition of Wagner's death. Contrast this with Wagner's Eine Sonate für das Album von Frau Mathilde Wesendonck which is much more tonal than the Liszt, and lighter. Yet, Aimard graces the music with a sensitive rubato enabling the emotional journey to complete. Then the comparison of Liszt's Unstern! -Sinistre S208 with Scriabin's Piano Sonata No.9, Op.68 shows the approach to dark themed music (as if La Lugubre Gondola wasn't dark enough). Unstern! is heavy and menacing where Op. 68 "Black Mass" starts softer and more reflective. Yet, the further we get into either piece the deeper the sense of foreboding. Here Aimard brings out the character of the music while highlighting the connection between the two. Liszt's "Tangatu Manu" from Minature estrose, book 1 is as Ligeti-like as anything I've heard from the romantic period, reaching well into the 21st century in terms of sonic impressions. Yet, follow that with Les jeux d'eau a la Villa d'Este and you return to the lush world of romantic music. Capping off the The Liszt Project is Vallée d'Obermann, a dark piece to echo the opening, but ending with episodes of ecstasy. That is true of the entire album, from dark to light, solid to bright and filled with ecstasy. With nearly 2 hours of music, The Liszt Project continues to astound not only with just how beautiful the music of Liszt is 200 years after his birth, but how completely immersed he was in the multitude of styles of the day, capturing a sense of what other great composers felt -- Liszt commanded it all. Pierre-Laurent Aimard not just combines these great works with stunning performances, but brings a fresh look at timeless music.